Wednesday October 19th 1921 We went to Mrs Swishers for the day to celebrate both she and Lonnies birthday. We rode with Fannie. I stopped in town to get some things. Home at 5 oclock and in the evening we went to see The Merchant of Venice. Good letter from Minnie. Thursday October 21st 1921 It is 36 years we put Bro Charlie away. It was nice today and we did a lot of work. We were both working out side most of the time. Monte here in afternoon. We got some screens out and storm sash in. The man finished the work. Hattie and I walked over to the Presbyterian church and back. Letters from Lydia and Lizzie Lindley. Friday October 21st 1921 Hattie had Mrs Williams to help all day and a student in afternoon. I did a lot of work for myself in the way of airing things and cleaning my rooms. Mollie over to stay all night. She was tired. we all went to bed early. Saturday October 22nd 1921 Did some sewing what spare time I had. I walked out to Hedges early in afternoon. Hattie busy with closets so I walked to town at 4 oclock and went to be near Will a few moments. We spent evening with Fannie. 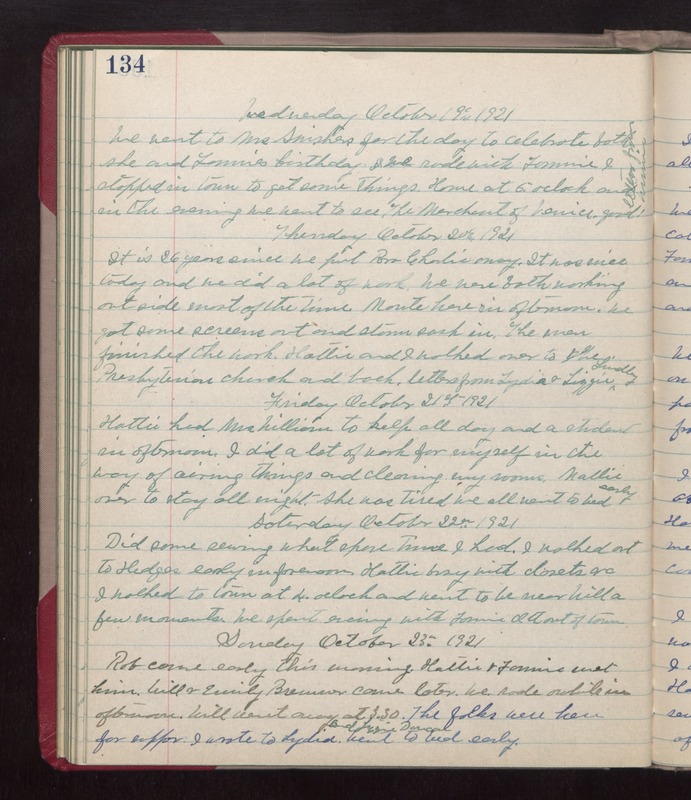 Ott out of town Sunday October 23rd 1921 Rob came early this morning. Hattie & Fannie met him. Will & Emily Bremner came later. We rode out awhile in afternoon. Will went away at 3.30. The folks were here for supper. I wrote to Lydia. went to bed early.